Remember before you speak, it is necessary to listen, and only then, from the fullness of your heart you speak and God listens. Mother Teresa, No Greater Love, ed. Becky Benenate and Joseph Durepos, with a foreword by Thomas Moore, p. 9. Morale is the state of mind. It is steadfastness and courage and hope. It is confidence and zeal and loyalty. . . . It is staying power, the spirit which endures to the end—the will to win. With it all things are possible, without it everything else . . . is for naught. H. A. DeWeerd, ed., Selected Speeches and Statements of General of the Army George C. Marshall (1945), quoted in Robert A. Fitton, Leadership Quotations from the World's Greatest Motivators, p. 197. We live in an age of theatricality. You can see it everywhere. In shopping malls. In TV news programs. In music programs. Even in the supermarket. There is a reason for this: People who have a product to sell or a message to communicate feel the need to intensify the delivery of their message. Merchandisers use high-impact graphics and artful staging to display their products in the most appealing manner. Advertisers produce creative messages for TV, radio, and the Internet as a means of gaining attention. As a result, the rest of us feel that we need to put some pizzazz into our messages in order to be heard and, better yet, understood. As a result of this pervasive theatricality, the straightforward stand-up presentation may appear tired and dated. At times, it may actually be so. 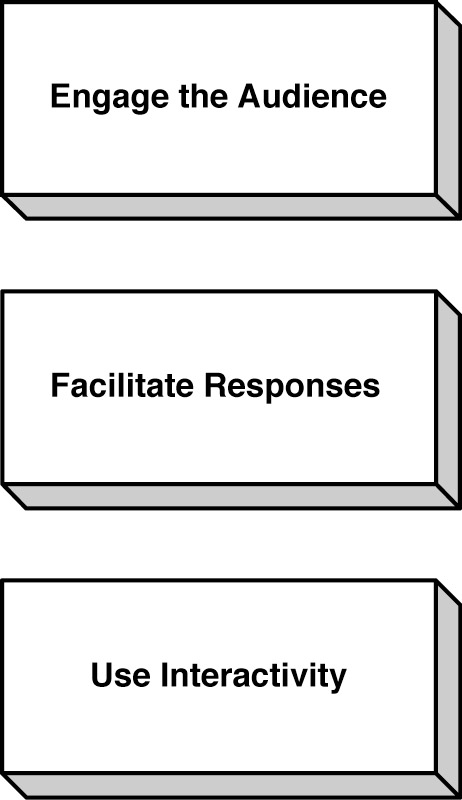 When that occurs, you can extend yourself beyond words and pictures in order to connect with the audience (see Figure 9-1). There may be occasions when you want to think like a promoter and present like a professional actor. In fact, actor-turned-President Ronald Reagan spent the bulk of his time doing what he did best—communicating. He worked hard at his speeches, and he delivered them with the practiced skill of an actor. In fact, Lou Cannon, his biographer, has written that Reagan was very proud of his acting ability; he took umbrage at political enemies who sought to dismiss him and his policies by calling him a lousy actor. Reagan wondered how anyone could function as president without acting experience. Lou Cannon, President Reagan: A Role of a Lifetime., pp. 46, 51.